Companies of all sizes going through a digital transformation are relying on a foundation of accurate, complete, and relevant data. With trusted data, they fuel a number of powerful initiatives including customer experience, operational efficiency, and advanced analytics. But, errors in data exist. And when most companies start looking into their data, they realize the data problems are worse than they thought. They look to improve the quality of their data but navigating the options for trusted data solutions can be daunting. 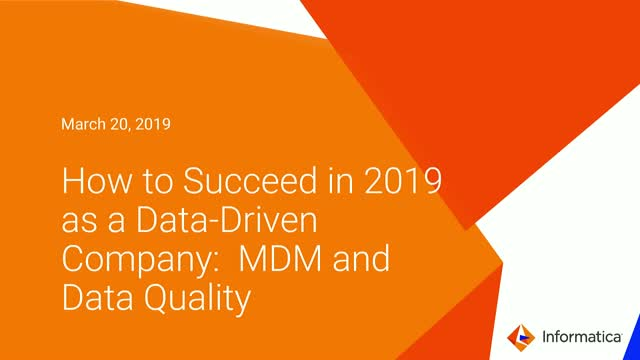 In this webinar, Prash Chandramohan and Monica Mullen of Informatica will focus on the outlining the difference between Master Data Management and Data Quality. If you’re trying to build a foundation of trusted data to fuel your digital transformation and want to better understand the tools and their purpose, register for this webinar today to learn more. We’ll share how a trusted source of clean, relevant, and complete data can help you succeed in 2019 as a data-driven company.